David S. Larson, an award-winning Fortune 500 marketing executive, has written WEST: Journey Across the Plains; Mr. Meeks (a sequel to WEST); The Last Jewish Gangster, The Early Years; MAYDAY: A Collection of Short Stories; A Silken Thread screenplay adaptation (with Debbie Allen attached); Savage Reprisal screenplay adaptation; Pit Stop screenplay; ghostwritten a historical fiction fantasy. His current projects include the second tome of The Last Jewish Gangster, The Last Years; three sequels (North, South, and East) to WEST and Mr. Meeks; The Lamb's Pimp, an account of his teen years raised by evangelical holy-rollers; and, Another Brick in the Wall, the biography of an Iranian rebel descended from royalty. West: Journey Across the Plains by David S. Larson is an amazing chronicle of the journey of the Jennings family. The family plans to travel from Pittsburgh to San Francisco, seeking out their fortunes like so many in the mid to late 1800s. However, tragedy strikes the eldest Jennings’ child, Sarah, in the form of a fever. Unbeknownst to the family, Sarah recovers, but is left without means to contact her family, so she must resort to drastic means in order to support herself. Finally gaining her freedom, Sarah travels west, desperately hoping to get in contact with her lost family. The Jennings family, on the other hand, is faring no better, struck down with many of the common things to befall travelers in covered wagons. Will Sarah be reunited with her family, or are they forever to be parted? I was captivated by this novel from the very beginning. Mr. Larson states in the introduction that the story comes from letters and diaries of the actual Jennings family. True or not, this remains a mystery to me, but I wouldn’t doubt for a second that this actually happened. I am from the San Francisco area in California, and it was fascinating to read first-hand accounts of what life was like then. Sarah’s journey is fraught with so much pain, touching on many topics that were considered taboo at the time. David S. Larson covers almost every danger faced by pioneers at the time. West: Journey Across the Plains is certainly a must-read for anyone interested in this time period, and the diary entries will draw you right into the characters’ lives, trials, and tribulations. Take a walk into the past in David Larson’s harrowing tale, West: Journey Across the Plains. Jonathan Jennings and his family leave their life in Pennsylvania and head west in the spring of 1849. Full of hope and adventure, they seek a new life in California. Desiring to keep a record of the journey, Jonathan pens daily activities in a journal. Upon arriving in Missouri, his daughter Sarah becomes critically ill. Believing her fate is death, the Jennings family leaves their beloved Sarah in the care of others, and departs with the wagon train. Their pioneering journey is a tumultuous quest; it takes its toll on the body, soul and spirit. Sarah does not perish; she improves, only to be put into a life of servitude to Madam Floret. She, like her father, writes of her life. West: Journey Across the Plains chronicles the lives of Sarah and her family, portraying their pioneering spirit and relentless resolve to find each other, no matter the cost. David Larson gives an historical account of the heart of a pioneer in his narrative. Larson pens two stories in one: the life of an abandoned daughter as it parallels with the lives of the family that left her behind. The narrative is written as two separate journals, depicting two worlds set apart from each other, but forever joined by the threads of family. Each journal entry coincides with the other in chronological order. This technique causes the plot action to move rapidly and read with ease. Larson's story is captivating and heart wrenching. It not only tells of the arduous pursuit of obtaining a new life during California’s gold rush in rugged, treacherous and hostile territory, but the despair of lost love and loved ones. West: Journey Across the Plains by David S. Larson takes us back in time and introduces us to Sarah Jennings and her family as they travel across the country in 1849. The bad news for Sarah is that while in Independence, Missouri, she catches a fever and the doctor tells her family that she will certainly die. Her family leaves her there so they do not catch the illness and makes their way along the Oregon trail, her father having left behind money enough for her to be taken care of until she passes and her burial. Sarah does not die, however, and must find a way to make her way in the world as her family makes theirs. This is a dirty and gritty look at what it must have been like for the settlers who went out west. So many of them died along the way and occurrences such as what happened with Sarah were normal instead of the exception. The fact that Sarah ended up having to sell her body to make a living is at times very hard to read, and at the same time you can't turn away; you want to see how she carries on. The layout of this book is interesting; it is presented in the form of letters and journals as it tells two stories of heartbreak and life in general at the time. David S. Larson has brought the characters to life here and made it a truly engaging read that I enjoyed. Anyone who enjoys westerns is going to appreciate this look into the life of one family separated by thousands of miles. West: Journey Across the Plains is an historical drama by David Larson. Set midway through the 19th century during the height of the California Gold Rush, West chronicles the story of the Jennings family as they head to San Francisco. It is first told through the journal entries of the family's patriarch, Johnathan, a merchant from Pittsburgh who plans to expand his business in California. West soon splits into two narratives as the pioneering family suffers separation when Sarah, the oldest daughter, falls ill and has to be left behind in Missouri. Both narratives recount their mounting struggles to survive and their determination to be reunited again. It's a harrowing journey, detailed plainly yet still Larson does so much to evoke the hardships of the time period. When I first read West I have to admit I was a bit thrown by the lack of strong detail to really cement the setting and time period. I was expecting descriptions of dress, food, and modes of transportation that pepper most historical novels, but what Larson does is manage to ground his characters and pull us into their heads in such a way that we don't need all the extra details to feel their authenticity. The writing is strong and does a good job of pulling you into the story. West: Journey Across the Plains is a book that can easily be read in one sitting. Filled with noble characters determined to persevere even during the harshest conditions, West: Journey Across the Plains by David Larsen makes for a heartfelt, fast-paced read. In an absolutely stellar book by author David S. Larson, West: Journey Across the Plains will fill readers with awe, despair and hope, sometimes all at the same time. Follow the story of the Jennings family, just one of the many traveling to the Western United States during the gold rush of 1849, when hopes were high but life was not easy. Told through the journals of family patriarch, Johnathan, and his seventeen-year-old daughter Sarah, the story will break the reader's heart. Sarah grows ill with a fever during the journey, and the rest of the family must leave her behind. The likelihood of her death is great, and Johnathan can't take the chance that the rest of the family might be infected. Sarah does recover, but only finds greater misery. All alone, she has little choice but to support herself with her body, and the horrors she endures are great. Johnathan and the rest of the family face great danger and distress during their trek west, a trek during which many just like them die every day. What will become of the Jennings family? You'll need to read the book to find out. West: Journey Across the Plains was simply a phenomenal book. Author David S. Larson has done a fabulous job in creating characters that readers will certainly connect with and care about. His scene setting is so skilled that readers will feel the heat on their backs and the dust in their faces, and much, much more. West is a book that will stay with the reader long after they have finished the last page. I recommend this book highly. Any reader who enjoys historical fiction will love West: Journey Across the Plains. I am very much looking forward to reading more from author David S. Larson as soon as I possibly can. West: Journey Across the Plains by author David S. Larson is truly an amazing entry in the genre of historical fiction. The gold rush of 1849 is in full swing at the start of the book, and the Jennings family - father Johnathan, his wife and their children, Sarah, Simon, Rebecca and Deborah - are set to make the grand journey across the country in an attempt to secure their piece of the treasure hidden in the hills. But when Sarah gets deathly ill, Johnathan makes the difficult decision to leave her behind, certain that she will die, and if the family stays with her, they will surely be infected and die as well. Sarah's fate is not death, although some might say it's worse than that. After she surprisingly recovers, she must support herself as a prostitute, and her life is filled with unimaginable horrors. At the same time, the rest of her family is continuing their treacherous journey. In a time period where disease, starvation and accidents claimed the lives of many, it seems unlikely that any of the Jennings family will make it, but throughout all of their difficulties, somehow, inexplicably, hope remains. I loved this book. Loved. It. How's that for a review? Author David S. Larson has written a masterful story that will absolutely keep his readers turning the pages from start to finish, and at the end will have them wishing for more. With characters that will stay with you long after you've finished the story and scenes so poignant that tears will come to your eyes, this is not a book that you will easily forget. I absolutely recommend West: Journey Across the Plains, and I certainly hope that David S. Larson is already hard at work on his next one. If it's anything like West it's sure to be a masterpiece! 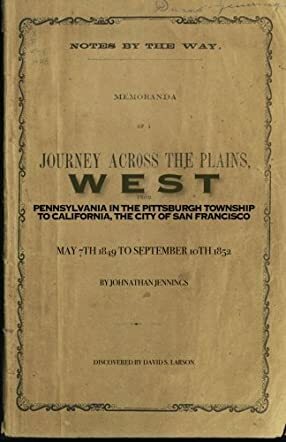 West: Journey Across the Plains by David S. Larson is about the 1849 migration of the Jennings family to San Francisco, California, from their home in Pittsburgh, Pennsylvania. Written in the form of both letters and accounts from Mr. Jennings' journal, we get to know this family of six from a first-hand perspective on their harrowing and heartbreaking — albeit genuinely inspiring — westward crossing. When a fever leaves seventeen-year-old Sarah Jennings without any hope for survival, the family presses forward without their oldest child. However, a miraculous recovery is made and Sarah is forced to move forward herself when faced with the grim reality of survival beyond the infirmity that separated her from her family. Ultimately, the journey is a test of endurance and hope for the family as a whole, as they struggle to find themselves both together and apart in the ubiquitous search for their dreams out west. Not generally one to enjoy reading stories told in the form of letters and journal entries, West: Journey Across the Plains was a refreshing change that immediately drew me in. I believe it is the first-person perspective and the way the story is structured that allows for the level of storytelling David Larson is able to bring to the pages. West: Journey Across the Plains is fast-paced and rapidly immersive with both its grit and unapologetic representation of the time. This is a no-holds-barred account based on the author's research of the real Jennings family, and Larson does not scruple in maintaining an authentic tone in the voice of this pioneering family and their experiences, which brings to life the plight of so many who struggled — and both faltered and triumphed — in the same vein. In West: Journey Across the Plains by David S. Larson, seventeen-year-old Sarah Jennings traveled west with her family from Pittsburgh to San Francisco in 1849. She fell ill with fever, and she was not given hope for survival. Doctors said if the family stayed they would surely succumb to the same illness. The Jennings family left her behind in Independence, at the beginning of the Oregon Trail, with enough money for her final care and continued on their journey. It proved more arduous than they imagined and the family suffered much loss. Pioneers headed west by the thousands, seeking fortune with the promise of gold, and less than half arrived safely. The Jennings family's journey is told through letters and journal entries woven together to make the story complete. David S. Larson wove an intriguing historical tale. The journal entries were arranged in a way that compelled me to continue reading. I was consumed with the need to find out what happened next. I was able to get to know the Jennings family and I felt as though I made the journey with them, suffering their hardships and loss. I particularly enjoyed Sarah's journal entries and her life after she'd been left behind in Independence. For no other reason than her misfortune of becoming ill during the trip, she was forced into a desolate existence, but she managed to maintain hope for a better future. A rewarding read, I highly enjoyed it and would recommend it to my friends. I wish there was a sequel to find out what happened in Sarah's later years. I was sad to see it end. West: Journey Across the Plains by David Larson is a riveting western fiction novel. The story tells of the Jennings family and their arduous journey from Pittsburgh to San Francisco in the late 1800s. The author does a superb job describing the trials, tribulations, and just overall rough times that these people lived in. A journey out west was a perilous thing and not everyone that started the trip finished it; disease, lack of food, bandits and more stood in the way of the journey. The family in the book faces hardship and heartbreak right away when one of their daughters becomes ill (not far into the journey) and they are forced to leave her behind. The rest of the book is told in a series of journal entries, letters and notes describing the family’s journey and also the journey of the daughter they left behind. Readers will be turning the pages in the hopes of seeing the family reunited out west. I found West: Journey Across the Plains to be a very interesting read. Larson seamlessly weaves the different characters' stories together and you really feel for them and root for them to overcome the odds and complete the journey. I can’t even imagine living in such times. We are so spoiled these days with all of our comforts, gadgets and amenities; it was eye-opening to read about what the Jennings family (and others in those times) had to endure just to survive. I would recommend this book to fans of adventure, Western and historical genres. In David S. Larson’s West: Journey Across the Plains, we go back to 1849, roughly a year after the discovery of gold nuggets in the Sacramento Valley which sparked the Californian Gold Rush. Throughout 1849, people around the United States borrowed money, sold or mortgaged their properties, or spent all of their life savings to make the arduous journey to California looking for a better life. The Jennings family was one of them. Thomas Jennings sold his property and closed his mercantile business in Pittsburgh, and with his family in tow, headed to San Francisco. With him was his wife Margaret, son Simon and twin daughters Rebecca and Ruth. Along the way, they left behind their 17-year-old daughter Sarah in Missouri where she was taken ill and was not expected to live. While the orphaned Sarah recovered from her illness and began a life of misery, hardships and uncertainties will rip her family further apart. Arguably one of the most significant events that shaped American history in the first half of the 19th century, the Gold Rush of 1849 tore families apart and changed their lives forever. West: Journey Across the Plains by David S. Larson is an intimate story of the Jennings family who made the journey from Pittsburgh, Pennsylvania to the city of San Francisco in California. This 2014 Peacemaker Award Finalist for Best Western Novel is truly heart breaking and touching. Original and descriptive, the story unravels through the diary entries of Sarah, the daughter who is left behind and her father Thomas. As such, it is an intimate look at real lives during that time. Sarah writes with the innocence of a 17-year-old while Thomas tries to be stoic and strong. In the end, one cannot help but feel sad for the Jennings family and the thousands of others who embarked on momentous journeys, looking for that proverbial pot of gold. In the end, family and love become more important than anything else and this is perhaps the greatest lesson we learn from this book. West, Journey Across The Plains is written by David S. Larson and tells the story of the Jennings family as they leave behind their comfortable life in Pennsylvania in 1849 and set off on a pioneering journey to start a new life in the West. Tempted by stories of great wealth in the gold rush, Jonathan Jennings takes his family on their new adventure as they head for San Francisco and promises of great fortune. All is not as he planned, however, as tragedy strikes the family time and again. The story follows the various members as they struggle to make something of the situations life throws at them. This is an incredible account of a family’s tortuous journey across the wilds of the West as they seek a better life. Told in the form of journal entries and letters, it gives an insight into the harsh reality of the times. The author, David Larson, has done a splendid job in crafting the story which left me not knowing at all whether this is purely a work of fiction portrayed in an alternative way, or was truly the work of the various members of the Jennings family. The story is emotional and the cruelty of the life of the early pioneers is well conveyed and, whether purely the work of the author’s imagination or reality, the story was moving to the point of being incredulous. This is a story that will stay with the reader for some considerable time. An excellent piece of historical fiction – or fact.